Hi everybody, and thanks for listening to The Skinny & Houli Show. Please tell your friends about the show and get them to “like” us or “friend” us or whatever the heck works on Facebook. Well it’s officially Summer, for us anyway, and we’re busy lining up guests for our show for the rest of the summer. Also we’ve been joined by our newest sponsor Reilly’s Daughter in Midway airport, so if you’re traveling thru Midway make sure you stop in and say hello to Reilly’s owner Boz O’Brien and his son Brendan. They’re celebrating their 35th year in the saloon business on June 16th so a big shout out to all the O’Briens and Reilly’s Daughter in Midway. Look for a cover story in the Irish American News July issue on the history of Reilly’s Daughter along with some funny stories of all the people they’ve served in the bar over the last 35 years. I stopped into Jack Desmond’s Irish Pub last weekend on a Friday night hoping to win the Sox tickets they were raffling off for the Cross-town Classic. I didn’t win but still had a blast hanging with bartenders Dana and Mo and our media guru Scott shot some fun video of me slamming beers at Jack Desmond’s late in the evening, so please check it out below. We’re going to put together a remote broadcast of The Skinny & Houli Show at Jack Desmond’s Irish Pub in the next couple weeks so please join us for that. It should be a fun party. Keep listening for dates and details and also check back regularly to this site for more info. 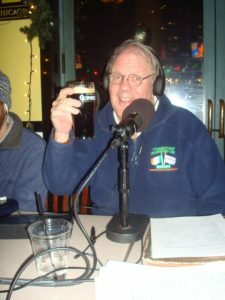 We’re also in talks with our old pal Billy Guide, owner of Cork & Kerry, about doing a remote from his newest place right by Cellular Field. We’re going to try and get down there during a Sox game and we’d love to have a Skinny & Houli night at Cork & Kerry II by the Park. They took over the old Jimbo’s location and really fixed it up nice, so watch for details on that one. Skinny and I will also be hitting the Catholic Charities golf outing at Cog Hill on July 27th and we’ll be doing a routine at one of the par three holes, “Beat Skinny & Houli”. We did the same routine last year and met hundred of great folks so come on out for that one and we’ll all lift a glass together. We want to pack these remote broadcasts with fans of the show so please join us and everybody will get an opportunity to shout “Who Cares!” during the show and those will be recorded for posterity. Don’t forget Irish Fest coming up at The Irish American Heritage Center the weekend of July 8-9-10th at 4626 North Knox. I’ll be there screening my film “Her Majesty, ‘da Queen” for those who missed it on Channel 11 last St. Patrick’s Day and also selling my book and DVDs, so let’s quaff a pint or two at the IAHC for Irish Fest. Short term don’t forget Ed Kelly’s annual Giant Awards at The White Eagle on Monday night June 27th for his annual sports night and I hope to see you there amongst the crowd of sports stars. Hope you all are digging the show and please send us your comments or questions. We’re interested in your reaction to all this talk about a return of the Southside Irish St. Patrick’s Day parade we keep hearing rumors about, so let us know what you’ve heard. Thanks for listening and please remember our great sponsors who put us on the air, Flood Bros. Disposal, Jack Desmond’s Irish Pub, Reilly’s Daughter, Lizzie McNeills, and O’Rourke Cartage.